Меркурий эбэтэр Мэндэҥэ диэн Күн систематын ордук кыра уонна Күнтэн чугас планетата. Күн тула 88 күн устата эргийэр. ↑ mercurial. Merriam-Webster Online. Тургутулунна 12 Бэс ыйын 2008. ↑ Yeomans, Donald K. HORIZONS System. NASA JPL (April 7, 2008). Тургутулунна 7 Муус устар 2008. ↑ 3,0 3,1 3,2 3,3 3,4 3,5 3,6 3,7 3,8 Mercury Fact Sheet. NASA Goddard Space Flight Center (November 30, 2007). Тургутулунна 28 Ыам ыйын 2008. ↑ 4,0 4,1 4,2 4,3 4,4 4,5 4,6 4,7 Munsell, Kirk; Smith, Harman; Harvey, Samantha. 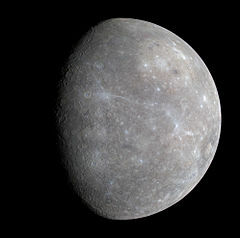 Mercury: Facts & Figures. Solar System Exploration. NASA (February 25, 2008). Тургутулунна 7 Муус устар 2008. ↑ 5,0 5,1 Seidelmann, P. Kenneth; Archinal, B. A.; A’hearn, M. F.; et.al. (2007). «Report of the IAU/IAGWorking Group on cartographic coordinates and rotational elements: 2006». Celestial Mechanics and Dynamical Astronomy 90: 155–180. DOI:10.1007/s10569-007-9072-y. Проверено 2007-08-28. ↑ Margot, L.J. ; Peale, S. J.; Jurgens, R. F.; Slade, M. A.; Holin, I. V. (2007). «Large Longitude Libration of Mercury Reveals a Molten Core». Science 316: 710–714. DOI:10.1126/science.1140514. PMID 17478713. Бу сирэйи бүтэһигин 15:05 26 Ахсынньы 2013 уларыппыт.